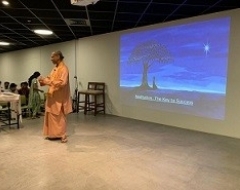 As part of the YSS Centenary year celebrations, devotees organized talks by YSS monks with employees of leading organizations to address their well-being based on the wisdom teachings of Sri Sri Paramahansa Yogananda. 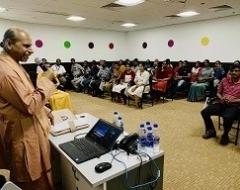 Swami Omkaranandaji was invited to address employees of Cognizant Technologies Solutions at their MEPZ campus, Chennai on Tuesday, January 10, 2017. He spoke on the topic “Meditation: Antidote for Stress, Fear, and Worry” from 4.30pm to 5.45pm. The hall which had a capacity of 100 persons, saw an overflow crowd of 130 attendees. Major Khjauriaji – YSDK Chennai Chairman, welcomed the attendees. He provided a short introduction about YSS and Swamiji. He then invited Swamiji to address the assembled gathering. 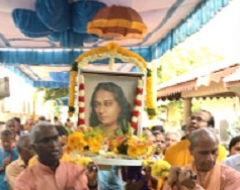 Swamiji by way of introduction began by touching upon his journey from early success in the business world to becoming a monastic. An informal slide presentation followed on the life of Yoganandaji, his worldwide mission and the building of his organization YSS/SRF. To reach one's full potential he averred the need to connect with one’s inner being, which is Love, Peace and Joy. The way to connect with one’s inner being he said was meditation. He anecdotally talked about the how the late Steve Jobs, founder and CEO of Apple, had made available as a parting gift to friends attending his funeral, a copy of ‘Autobiography of a Yogi’. 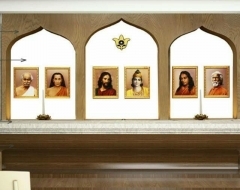 Paramahansa Yogananda and his lineage of enlightened Masters had made available to the world scientific techniques of meditation by which one could get in touch with one’s higher self. These techniques are scientific in that results are expected from their devoted, regular practice. Swamiji then led a guided meditation for 10-minutes towards expanding the consciousness. He closed with an exhortation to the assembled group to include meditation in their daily life and briefly touched upon the YSS lessons. The entire talk was well received with a few employees coming to talk with Swamiji to express their gratitude. YSS Chennai members also distributed free introductory literature to interested attendees.